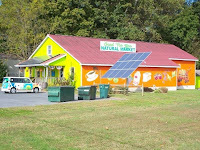 Check out our new Picasa album for Good For You Market. We're adding more daily. I'm still getting used to a fancy new camera and can't use it yet, hence the wobbly nature of some shots.